Junior Bobo Carpenter scored a power play goal in each period to lead BU to a 6-3 win against Connecticut at the XL Center in Hartford. Sophomore Patrick Curry fired home a pair of first-period goals and Captain Brandon Hickey added a third-period tally as the Terriers gained their first Hockey East win. BU grabbed an early lead with a power play goal just a minute into the game. Carpenter, who had scored two goals Friday night on the backhand, used the same weapon to beat Adam Huska, after taking an entry pass from sophomore Patrick Harper. Jordan Greenway also assisted. Just 20 seconds later, Curry, who had been elevated to the first line with Carpenter and freshman Brady Tkachuk, deflected home a shot from the left point by freshman Kasper Kotkansalo. Senior John MacLeod also assisted on the goal. BU, which dominated first period shots, 14-6, extended the lead late in the period when Tkachuk found Curry on the right side of the crease for his second goal of the night. Midway through the second period, UConn scored twice in a two-minute span with Alexander Payusov scoring on a power play and Spencer Nass corralling a loose puck and firing it off sophomore Jake Oettinger into the goal. Just three minutes later with BU on a power play, Carpenter went to the backhand again to convert the rebound of a Chad Krys shot, with Dante Fabbro picking up the other assist for a 4-2 margin after two periods. Half a minute into the final period Hickey one-timed a Greenway pass past Huska. Freshman Shane Bowers also assisted. 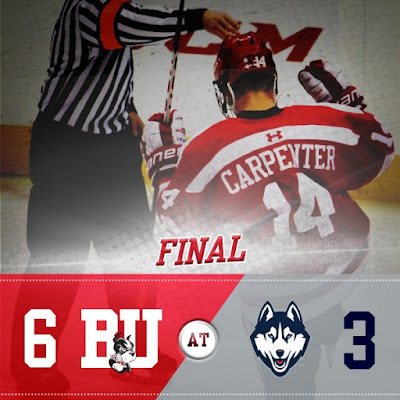 UConn would cut the lead to 5-3 on an even-strength goal, but at the 14:46 mark, Carpenter completed his first career hat trick on a redirect of Fabbro’s shot with Harper recording his second assist of the night. ►Oettinger finished the night with 27 saves, while Huska stopped 26 BU shots. ►Terriers converted on three of four power play opportunities and killed five of six Connecticut man-advantages. - For the first time this season, the Terriers had a dominant first period. Scoring twice in the first 89 seconds goes a long way in setting the tone of the game. - After a quiet start to his season, Carpenter has become a special teams sensation. His play is tenacious and he’s been getting to the perfect spots on the ice to convert via his backhand. - After getting a brief assignment to the top line last season, Curry showed he is now ready and capable of generating offense by scoring two goals in the first period. 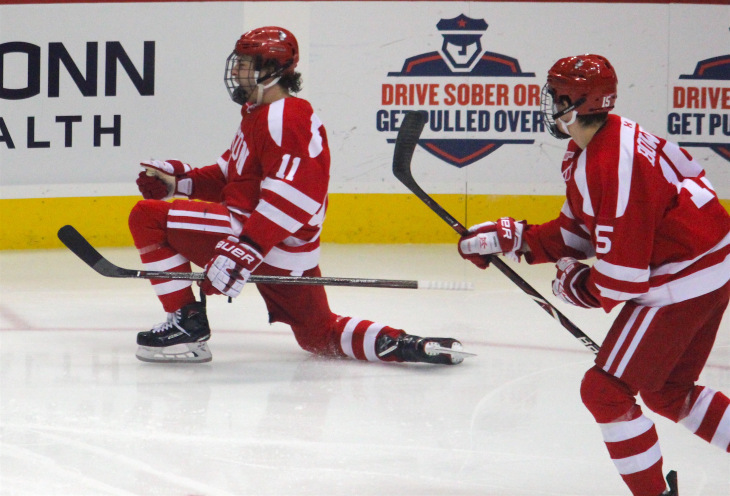 - Hickey came to BU with a reputation as an exceptionally gifted skater. His game has become much more balanced. He has a laser of a wrist shot and routinely uses deft stick work and physicality to keep opposing forwards to the outside. - While two UConn goals came with Oettinger out of position, the sophomore goalie was otherwise solid in net. - Tkachuk drew a penalty late in the third period on a tremendous solo effort behind the UConn extended goal line. He stole the puck and would have had a wrap-around goal if not for a Max Halter holding penalty. - Kotkansalo made several excellent breakout passes from deep within the BU end. - Kudos to a highly vocal BU Dog Pound who made UConn goalie Huska's evening a bit more miserable. Aside from Brass Bonanza (played after each UConn goal), they had the most audible sound in the XL Center. 2018 recruit Joel Farabee scored a power play goal in the NTDP U18s’ 7-2 loss to Harvard. The left wing from Cicero, NY, who scored a goal and added two assists the previous night against Dartmouth, is second on the U18s in scoring with an 8-5-13 line in 10 games. 2019 recruit Robert Mastrosimone’s unassisted goal was the game-winner in USHL Chicago’s 4-2 win against Madison. 2020 recruit Donovan Sebrango scored a goal and added an assist as the CIHA Voyageurs White defeated Smith Falls U18, 4-2. Jack Eichel scored his fourth goal of the season in Buffalo’s 5-4 comeback win against Boston. The Bruins had taken a 4-1 lead—with Charlie McAvoy assisting on two goals—before Eichel converted a rebound to narrow the margin to 4-2. Buffalo would tie the score in the third and win it in overtime. On Friday night, Eichel tallied his third goal on an impressive end-to-end rush in Buffalo’s loss to Vancouver. Brian Strait’s first goal of the season was the game-winner in AHL Binghamton’s 5-1 win against Laval. 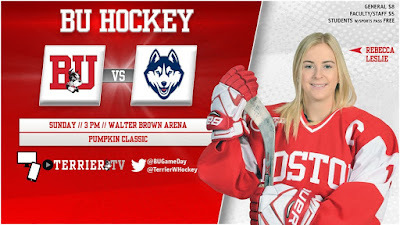 Terriers return to Walter Brown Arena for a 3 p.m. contest against Connecticut, dubbed “The Pumpkin Classic.” Senior Victoria Bach and freshman Kristina Schuler, with three points each, lead the Terriers, who are looking for their first win of the season. Bach has 10 career points against the Huskies. ●GoTerriers.com preview, Live Stats, TerrierTV, BUGameDay.